Thumbs Up It’s Thursday in Kingston upon Thames. Kingston offers a range of children’s activities during the holidays and half terms to entice shoppers into the town. 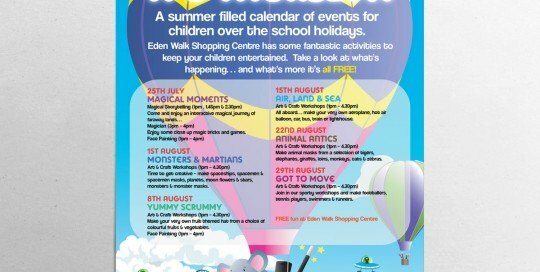 Eden Walk Shopping Centre offers a range of retail outlets, cafes and coffee shops. The centre is in the middle of Kingston upon Thames, Surrey. To raise awareness for child safety in their shopping centre. The brief was to create a child friendly, attractive campaign which also appealed to parents. We created a friendly hero character, an action figure, the design centred around their logo. 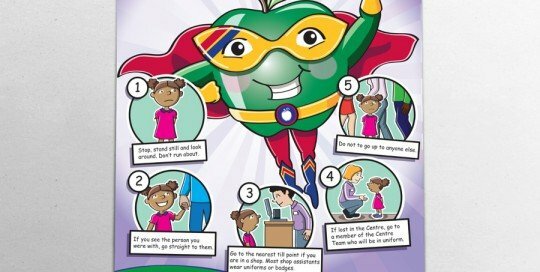 The important information that informs children what to do if they become lost is presented using friendly characters. Can we help you with your advertising or a promotional campaign? Contact us for a friendly chat, we don’t bite, contact us on 020 8288 7641 or why not request a quote. We’d love to your know thoughts on the work for this project. Social Butterfly. A business start up we had the pleasure of working alongside as they launched their company. The concept was to create a range of unique designer ‘Mummy cards” perfect for mums to give to friends for when their children had play-dates. The cards could be personalised so they could include doctors contact details, allergies or the cards could just be used as personal business cards. To design and research the concept for a new brand. We embarked on lengthy research to create the logo and the name for this exciting new business. The analysis led us to a striking and strong design which would be flexible across all media. The logo could also eventually be used as an icon on garments. 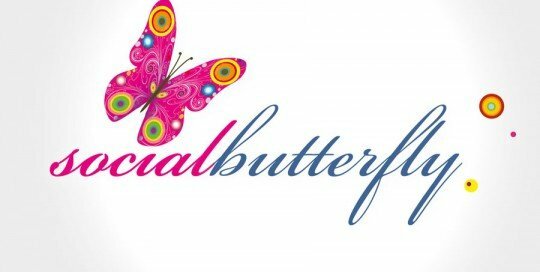 If you are a business start up or need a new logo creating we’d love to hear from you? The brief to promote the shopping centre to existing and new customers in researched key catchment areas. 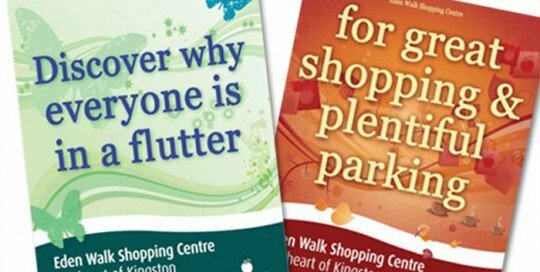 To produce a series of posters and press adverts to promote the shopping centre. The posters ran around the centre and also on road side bus signs in the key catchment areas. Eden Walk Shopping Centre is located in the centre of Kingston upon Thames and amoungst other benefits, offers a large car park in a prime location. The strap line’ Discover why everyone is in a flutter’ evokes excitement and stirs interest to busy, exciting shopping centre. This poster was to run in spring so the use of the butterflies added a seasonal feel. In the autumn we produced a clear and simple message’ ‘for great shopping and plentiful parking’. Part of the brief was to promote the convenient car park as well and the range of shops within the centre. The background illustration shows shopping bags and cars flowing around in warm autumnal colours.